Alll I could think of was "how brave." Would that I could hint of the peace that goes on still. She was certainly a positive thinker as well as a unique, much-loved and admired poet. Really like that Dickinson knows and accepts that the universe does not revolve around her. Good lesson for us all! Newf: It might not be too awful to live Ms. Dickinson. Quite a goal, I'd say. 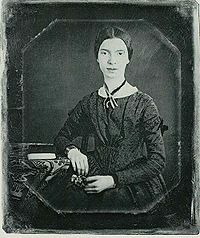 Obviously I meant I love Emily Dickinson. She got that one right, life goes on with or without us. I live Emily Dickinson, but had never read this one.